Women rowers from Wits University showed their class at a recent competition. Wits women rowers rose to the occasion this weekend, April 6 and 7, bagging eight medals, including three gold, at the University Sport South Africa Rowing (USSA-R) National Sprint Regatta in Cape Town. The 12 female rowers from the Wits University Boat Club (WUBC) representated the Johannesburg institution against other universities in one of the biggest rowing events of the year. They finished on top in three events including women’s double, and the women’s cox four. Rower Lauren Soll won gold after placing first in the women’s single scull. The third-year BSc student was the top performing Wits rower this past weekend and was selected for the Blues crew, which is made up of the top 12 fastest athletes in the regatta. “[The achievement] was so surreal. It’s been amazing this season. There are a lot more people in the team and we’re really starting to feel like a squad,” she told Wits Vuvuzela. Soll’s team mate Tegan Korevaar was selected for the Grudge crew representing the lower half of the top performing athletes. Third-year BSC student Lauren Soll wears her gold medal that she won after placing first for the women’s single scull at the USSA-R National Sprint Regatta last weekend. Photo: Naledi Mashishi. 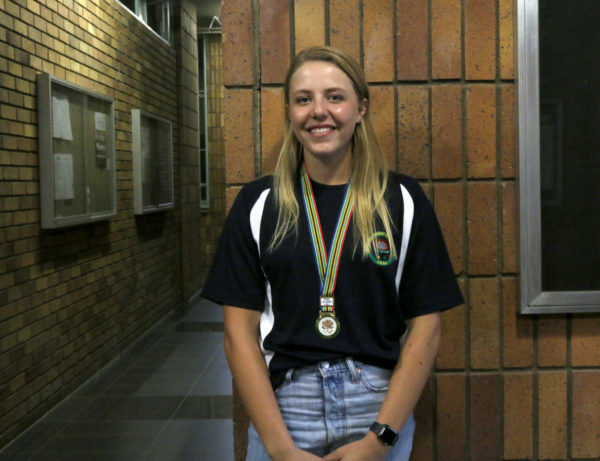 WUBC women’s rowing captain, Rain de Jager, told Wits Vuvuzela that the standard of rowing was being lifted and that her goal was to grow the women’s side. “We want to be a competitor for other universities, not just a social club” she said. Jager said that more women have joined the club over the past year and while some do it socially, more women are beginning to compete. Charles Stevens, USSA-R chairperson, told Wits Vuvuzela that one of his orgisations big focus this year has been to level the playing field between the genders. One of the ways that they have done this is by giving both genders equal opportunities to end the regattas as the last race of the competition is often seen as the highlight of the event. “The quality of women’s rowing is on the up, and more women have been getting involved in competing provincially and at nationals,” Stevens said. Stevens added that he is hoping to see women like Soll and Korevaar being involved in the selection process for world university champs being held in Shanghai later this year.